Cleaner fish are fish that provide a service to other species by removing dead skin and ectoparasites. Although the animal being cleaned typically is another fish, it can also involve aquatic reptiles (sea turtles and marine iguana), mammals (manatees and whales) or octopuses. The cleaning symbiosis is an example of mutualism, an ecological interaction that benefits both parties involved. However, the cleaner fish may sometimes cheat and consume mucus or tissue, thus creating a form of parasitism. A wide variety of fish including wrasse, cichlids, catfish, pipefish, and gobies display cleaning behaviors. Similar behavior is found in other groups of animals, such as cleaner shrimps. Cleaner fish advertise their services with conspicuous coloration, often displaying a brilliant blue stripe that spans the length of the body. This adaptation has evolved independently in different species of cleaner fish, making it an example of convergent evolution. Other species of fish, called mimics, imitate the behavior and phenotype of cleaner fish to gain access to client fish tissue. This is another example of convergent evolution. The best known cleaner fish are the cleaner wrasses of the genus Labroides found on coral reefs in the Indian Ocean and Pacific Ocean. These small fish maintain so-called cleaning stations where other fish, known as hosts, congregate and perform specific movements to attract the attention of the cleaner fish. Remarkably, these small cleaner fish safely clean large predatory fish that would otherwise eat small fish such as these. While they derive the majority of their nutrients by removing ectoparasites, cleaner fish also feed on the mucus and tissue of the client fish, as these food sources have greater nutritional value. There is however a risk of terminating the cleaning interaction if the cleaner is too aggressive, taking too much mucus and tissue. Because of this, cleaners seek a balance in feeding between ectoparasites and mucus or tissue. Cleaning behaviors have been observed in a number of other fish groups. Neon gobies of the genera Gobiosoma and Elacatinus provide a cleaning service similar to the cleaner wrasses, though this time on reefs in the western Atlantic, providing a good example of convergent evolution. Unlike the cleaner wrasses, they also eat a variety of small animals as well being cleaner fish, and generally do well in aquaria. However, the Caribbean cleaning goby (Elacatinus evelynae) gladly eat scales and mucus from the host when the ectoparasites it normally feeds on are scarce, making the relationship somewhat less than mutually beneficial. The symbiosis does not break down because the abundance of these parasites varies significantly seasonally and spatially, and the overall benefit to the larger fish outweighs any cheating on the part of the smaller. An interesting example of a cleaning symbiosis has been observed between two brackish water cichlids of the genus Etroplus from South Asia. The small species Etroplus maculatus is the cleaner fish, and the much larger Etroplus suratensis is the host that receives the cleaning service. Cleaning has infrequently been observed in fresh waters compared to marine waters, but at least in part this is possibly related to fewer observers (such as divers) in the former habitat compared to the latter. One of the few known examples of cleaning is juvenile striped Raphael catfish cleaning the piscivorous Hoplias cf. malabaricus. In public aquariums, Synaptolaemus headstanders have been seen cleaning larger fish. 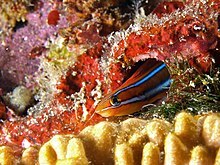 The bluestriped fangblenny is an aggressive mimic of the cleaner wrasse. Mimic species have evolved body forms, patterns, and colors which imitate other species to gain a competitive advantage. One of the most studied examples of mimicry on coral reefs is the relationship between the aggressive mimic Plagiotremus rhinorhynchos (the bluestriped fangblenny) and the cleaner wrasse model Labroides dimidiatus. By appearing like L. dimidiatus, P. rhinorhynchos is able to approach and subsequently feed on the tissue and scales of client fish while posing as a cleaner. The presence of the cleaner mimic, P. rhinorhynchos, has a negative impact on the foraging success of the cleaner model L. dimidiatus. P. rhinorhynchos feeds by eating the tissue and scales of client fish, making client fish much more cautious while at cleaning stations. More aggressive mimics have a greater negative impact on the foraging rate and success of the cleaner fish. When mimics appear in higher densities relative to cleaners, there is a significant decline in the success rate of the cleaner fish. The effects of the mimic/model ratio are susceptible to dilution, whereby an increase in client fish allows both the mimics and the models to have more access to clients, thus limiting the negative effects that mimics have on model foraging success. Similar species also include Plagiotremus tapeinosoma (the Mimic blenny),Aspidontus. Doctor fish, fish that provide a cleaning service to humans. Social grooming, cleaning services offered between members of the same species. ^ Curry, O. "Morality as natural history[permanent dead link]." University of London Ph.D. Thesis. 2005. Accessed 2009-06-08. ^ Grutter, A.S. (2002). "Cleaning symbioses from the parasites' perspective". Parasitology. 124 (7): S65–S81. doi:10.1017/S0031182002001488. ^ Sazima, C.; A. Grossman; I. Sazima (2010). "Turtle cleaners: reef fishes foraging on epibionts of sea turtles in the tropical Southwestern Atlantic, with a summary of this association type". Neotrop. Ichthyol. 8 (1): 187–192. doi:10.1590/S1679-62252010005000003. ^ "Manatee gets 'haircut' from gill fish". The Telegraph. 26 February 2010. Retrieved 18 August 2018. ^ a b Cheney, K.L. (2005) "Frequency-dependent success of aggressive mimics in a cleaning symbiosis", Proceedings of the Royal Society B, 272 (1581): 2635-2639. ^ Fenner, Robert M (2001) The Conscientious Marine Aquarist TFH Publications, pp 282-283. ISBN 1-890087-02-5. ^ Cheney, K.L. and M. Côté (2005) "Mutualism or parasitism? The variable outcome of cleaning symbioses" Biology Letters, 1(2): 162-6. ^ Richard L. Wyman and Jack A. Ward (1972). A Cleaning Symbiosis between the Cichlid Fishes Etroplus maculatus and Etroplus suratensis. I. Description and Possible Evolution. Copeia, Vol. 1972, No. 4, pp. 834-838. ^ Carvalho, L.N. ; J. Zuanon; I. Sazima (2007). "Natural history of Amazon fishes". In Encyclopedia of Life Support Systems (ed.). Tropical Biology and Natural Resources Theme. 1. Eolss Publishers, Oxford. pp. 1–24. ^ Carvalho, Lucélia Nobre; Arruda, Rafael; Zuanon, Jansen Zuanon (2003). "Record of cleaning behavior by Platydoras costatus (Siluriformes: Doradidae) in the Amazon Basin, Brazil" (PDF). Neotropical Ichthyology. 1 (2): 137–139. doi:10.1590/S1679-62252003000200009. Archived from the original (PDF) on 2007-09-27. ^ "Broadband red headstander". National Aquarium Denmark. 2016-10-03. Retrieved 18 August 2018. ^ a b Cheney, K.L. (2008) "Facultative mimicry: cues for colour change and colour accuracy in a coral reef fish", Proceedings of the Royal Society B, 275 (1631): 117–122.